At the joint press conference with Philippine Foreign Secretary Teodoro Locsin on 1 March 2019, the US Secretary of State Michael Pompeo, after attacking China by stating that “China’s island-building and military activities in the South China Sea threaten [the Philippines’] sovereignty, security, and therefore economic livelihood, as well as that of the United States”, announced, “(a)s the South China Sea is part of the Pacific, any armed attack on Philippine forces, aircraft, or public vessels in the South China Sea will trigger mutual defense obligations under Article 4 of our Mutual Defense Treaty (MDT).” It is obvious that the possible attack on Philippine forces, as Pompeo implies, is from China and if that happens, the US will fight with the Philippines against China. Since this joint press briefing was held after Pompeo’s courtesy visit with Philippine President Duterte the previous night, such a message must have been conveyed to Duterte. Pompeo’s recent interpretation of the MDT has put the spotlight on reviewing the MDT. How the Philippines answers this question and acts accordingly will not only impact US-Philippines relations but also the overall security situation in the South China Sea. Within the Philippines there are both supportive and opposing voices around the MDT. The opposition movement started in the 1980s and only subsided in the early 1990s after the removal of US personnel from the Philippines. With the China-Philippine dispute over the South China Sea escalating and the US “pivot to Asia” unfolding in 2011, voices to strengthen US-Philippine military ties grew in both countries. The 2011 Manila Declaration, signed by the Philippines’ then Foreign Secretary Albert. F. del Rosario and US’s then Secretary of StateHillary Clinton, formally reaffirmed both countries’ commitment to the MDT. 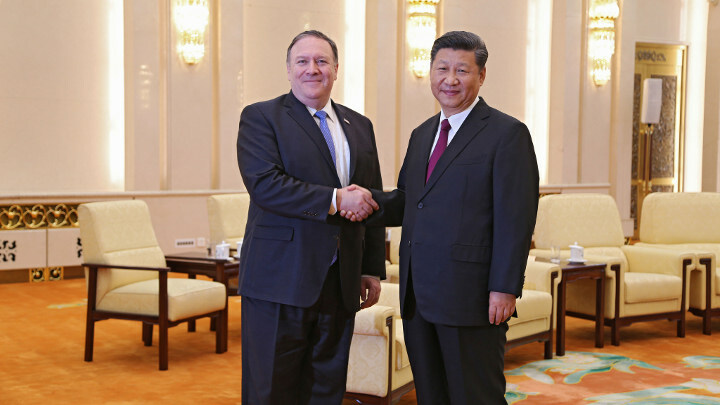 However, up until Pompeo’s remarks on 1 March, no US high official has ever openly claimed that the MDT covers the South China Sea. Pompeo’s remarks have promoted different responses within the Philippines relating to the review of the MDT. While up until now comments have yet to come from President Duterte’s Office, the heads of the most relevant departments, such as the Philippines’ Department of Foreign Affairs and Department of Defense, have expressed divergent positions. At the same press conference mentioned above, Locsin commented on the US-Philippine alliance by emphasizing its contribution to the mutual defense of both countries as well as to “regional peace, freedom, stability, and prosperity.” According to Locsin, the key to mutual defense between the two allies is “the sincere mutual desire to help and be helped.” He further stated, “(s)ome seek a review of the MDT. This requires further thought.” As a professional lawyer, Locsin presented his comment on the current MDT, “(i)n vagueness lies uncertainty, a deterrent. Specificity invites evasion and actions outside the MDT framework.” Then he clearly stated what is most needed now by the Philippines from the US, which is “helping the Philippines build up our self-defense capacity”. The review of the MDT was called for by the Philippines’ Secretary of Defense Delfin Lorenzano in December 2018. On 5 March 2019 Lorenzano released a statement publicly contradicting Locsin. As a career military officer, Lorenzano insisted that “ambiguity or vagueness of the MDT will not serve as a deterrent”, rather creates “confusion and chaos during a crisis”. He further elaborated that a review is necessary because the security environment is now “vastly different and much more complex” than the bipolar security era when the MDT was signed in 1951. To prove his point, he used the example of the clash between China and the Philippines over Meiji Reef (Mischief Reef) in 1995 and further stated that “the US did not stop it.” Lorenzano seems to indicate that it is due to the vagueness of the MDT that the US did not join the Philippines to “stop” China in 1995 and that the security risk facing the Philippines now comes mainly from the disputes over the South China Sea, therefore to “stop” future threats from China, the review of the MDT is needed to eliminate vagueness. Pompeo’s remarks relating to Article 4 could meet Lorenzano’s demand. However, in the same statement, Lorenzano further explained that it was not the lack of reassurance but “being involved in a war that we do not seek and do not want” that had been worrying him. He added that the US Navy’s increased presence in the South China Sea might trigger a shooting war which would automatically involve the Philippines on the basis of the MDT. By the latter Lorenzano seems to point out two layers of risks in front of the Philippines. First, the danger of conflicts between China and the US in the South China Sea is surging because of the increased presence of the US Navy there. Second, if such conflicts happen due to the US’s increased naval presence in the South China Sea, the Philippines will automatically be dragged into the conflict on the basis of the MDT. Lorenzano’s elaborations on the reasons behind his push for the review however display the reality of the US-Philippine alliance and relationship. It is not that the MDT is a double-edged sword, assurance of security as well as target of attack, but the weaker country has less maneuvering power in making choices than the stronger one. The US Secretary of State has clarified the US’s current interpretation of Article 4 of the MDT. There are mixed reactions within the Philippines relating to the review of the MDT. No matter the position represented by the Philippines’ foreign secretary, that vagueness in the MDT creates an inevitable obstacle. Therefore, it is not necessary to review the MDT to meet the current security threats, as the Philippines’ defense secretary has requested. The reality of the matter is that countries tend to make decisions according to their own interests. Security concerns in the South China Sea continue to stir for countries within the region and beyond. Currently, China, the Philippines, and other ASEAN countries are working together to establish a Code of Conduct to peacefully manage the disputes in the South China Sea. However, the US’s confrontational policy and actions towards the troubled waters exacerbate ASEAN countries’ worries over possible conflict between China and the US. With big-power competition intensifying in the South China Sea region, the Philippines may have to face the dangerous task of choosing sides. Either way could lead to challenges for the Philippines economically, politically and militarily. This article was originally published at China-US Focus. Are China and the U.S. Heading for Open Confrontation?